India is known as the nation of custom, religion, and devotion. It is the nation that is known for its unity and diversity. You will find different people, belonging to different religion living together in peace and harmony. It will be no surprise if you find Muslims celebrating Diwali, Sikh celebrating Eid and Hindu celebrating Christmas. India is unique like that. India is also globally known for celebrating all the festivals with enthusiasm and joy. Kumbh Mela is no exception. Kumbh Mela commenced on January 15 (Makarsakranti) and will go on till March 4 (Mahashivrati) is known as the largest congregation of pilgrims in the world. Categorized in three categories- Ardh Kumbh, held in every six years; Purna Kumbh, held in every 12 years and Maha Kumbh, held in every 144 years or after the conclusion of 12 Purna Kumbha the event caters to a large number of people. It is a mass Hindu pilgrimage of faith in which Hindus gather to bathe in sacred water to be freed from the vicious earthly cycle of life and death and move towards heavenly realm, which knows no suffering or pain. “An eternal life free of sins” is the promise that comes attached with the magnificent event of Kumbh Mela. It’s the promise that attracts millions of people. It’s the promise that makes Kumbh Mela what it is today. Legend has it that in mythological times, during a waging war between demigods and demons during Samudra Manthan (churning of the ocean) for the possession of elixir of eternal life or Amrit. To seize the Amrit from the demons, Garuda (vehicle of Lord Vishnu) took the Amrit and flew away. During his flight few drops of it had fallen on to the four places that are today known as Pryagraj, Nashik, Haridwar, Ujjain. It is believed that these drops gave mystical powers to these places and the rivers flowing in the city. It is to make oneself gain those powers that Kumbh Mela has been celebrated in each of the four places. Depending on the positions of the Sun, Moon, and Jupiter hold in that period in different zodiac signs, the venue for Kumbh Mela is decided. As per the Vedas, the Sun is admitted as soul life, the Moon as lord of mind and Brihaspati (Jupiter) is considered as the guru of Gods. 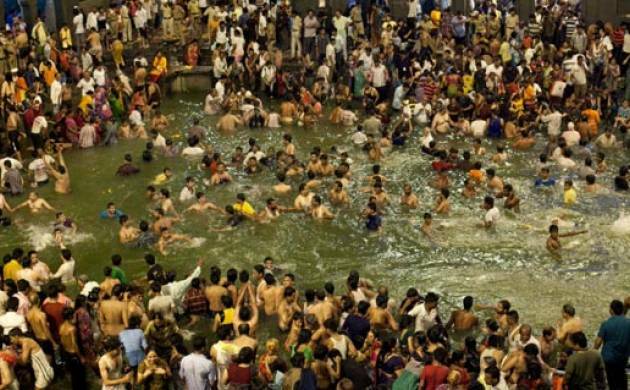 Read here in detail the history of Kumbh Mela – Why and where it is celebrated? Also Read - Top 16 Must Visit Places In Rajasthan! Earlier in 2017 at Jeju, South Korea, UNESCO’s Intergovernmental Committee for Safeguarding of the Intangible Cultural Heritage had adorned ‘Kumbh Mela’ on the Representative List of Intangible Cultural Heritage of Humanity. The first royal bath (Shahi Snan) of the Ardh Kumbh Mela was observed on the auspicious day of Makar Sankranti. 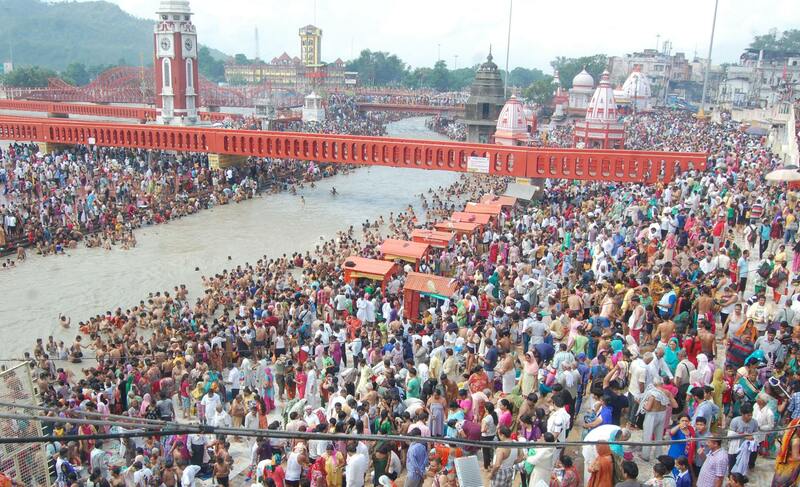 It is here that all the prominent religious groups take a dip in Triveni Sangam in Pryagraj. The sadhus and sants are the first one to take a dip in the holy water and then afterward the public is allowed to bathe. The devotees were standing in queue since 3 a.m waiting for their turn. It was the first time that the seers of kinnar akhada, led by its Mahamandaleshwar Archarya Lakshmi Narayan Tripathi, arrived with Juna Akhada saints for the royal bath at Sangam. According to official estimates, over 15 crore people are expected to visit Kumbh Mela, which is organized over 10,000 acres of land, and 33 lakhs have already taken a dip in the sacred water. Invitations have also been sent to all the villages in India. There has been special care given to sanitation in the fair as so many people are expected to visit. 1 lakh makeshift toilets and 20,000 sanitation workers are working to keep the place clean. The city of Pryagraj never sleeps during the Ardh Kumbh Mela. The daytime is crowded but one can enjoy the beautiful city view from the Triveni Ghat in the evening. The lights from the tents look like the stars have graced the earth and are shining in the city of Pryagraj. On the first day of Kumbh Mela, Smriti Irani Textiles Minister took a dip in the holy water. President Ram Nath Kovind, Uttar Pradesh Governor Ram Naik, Chief Minister Yogi Adityanath performed ‘Ganga Pujan’ at Sangam on January 17, 2019. The first historical description of this great fair in Pryag was found in 643CE in the writings of Chinese Buddhist monk Hsuan Tsang who has been in India. He wrote about the gathering of pilgrims in Pryag during the month of Magh as an ‘age-long festival’. Uttar Pradesh Government led by Mr. Yogi had allocated Rs 4,200 crore for the Kumbh Mela which is over thrice the budget of Maha Kumbh in 2013, making the Maha pilgrimage perhaps the costliest ever. The Yogi government has made provisions for the laser light and sound shows. The show has commenced almost a month before the beginning of Kumbh at the Pryagraj Fort Wall. While Ramlila and Krishna Lila has been staged during the event, and international ballet themed around the Ganga has been planned this time. Kumbh Mela is truly a gathering filled with peace and faith and is celebrated with great eagerness. The calmness of holy water and the wonder of people coming together is definitely a sight to relish. The mela returns to each of the cities after 12 years and one is considered lucky to have taken part in such a prosperous event. Have you been to Kumbh Mela yet? If yes, let us know in the comment section!